VHeadline editor & publisher Roy S. Carson writes: I do NOT necessarily agree with El Nacional editor Miguel Enrique Otero or Globovision director Alberto Federico Ravell when they use an Inter-American Press Association (IAPA-SIP) meeting in Madrid to bully-pulpit their particularly partisan claims that the Venezuelan government of President Hugo Chavez Frias is orchestrating "a repressive and restrictive campaign" against the opposition media ahead of November 23 local and regional elections. Of course, Otero and Ravell are going to say that Chavez is "the devil incarnate" ... and they are going to continue to believe that Venezuela is a dictatorship ... and they are going to continue to believe that only a restitution of the quasi-democratic form of government they supported, collaborated with and enriched themselves upon during the pre-Chavez era, is their particular Northern Light to personal ambition. It's NOT to say that everything in Chavez' particular cabbage patch is hunky-dory ... quite plainly it isn't. With the full weight of a raucous privately-owned opposition media braying for his blood and guts these last ten years, there's perhaps some residue of understanding -- though NOT approval -- for what the President's Miraflores Palace spinmeisters get up to in the claustrophobic closets of their minds. They've been imbued with a siege mentality since the word go and scarcely a kind word has been uttered for the President in anything other than the stoically pro-government media. Regrettably it's part and parcel of the rampant sectarianism that's polluted Venezuelan politics with either side equally as guilty of excesses as the other. THE TRUTH -- as always -- has been the first victim in the battle of opposing ideologies with the anti-Chavistas claiming that they, and they alone, are the exclusive interpreters of what is well and good; and the pro-Chavistas claiming exactly the same with the full force of Revivalist rhetoric, and then some! One needs only to look at the exponents of Venezuela's media image to understand that Fox News would have a hard time keeping up with the Gonzalez' if they ever had had any understanding for the bastardization of politics other than inside their own little world of the Washington Beltway. Otero and Ravell may not yet have achieved the elder statesmen senility of some of their confreres in the Venezuelan media, but they're heading up the same slippery slope, panicked by the thought that they may NOT be able to reach their own personal pinnacles and trying to make sure that any younger usurper ends up in the carnage at the bottom of the ski slope if they pretend a challenge. 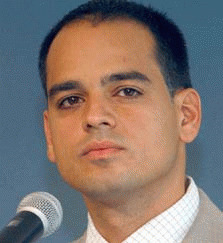 Previously fired-up Chavez partisan Andres Izarra, offspring of Chavista political theorist William of the same surname, was once upon a time a news-hawk in the employ of Radio Caracas Television (RCTV) until the day (in April 2002) when he was ordered to broadcast Mickey Mouse and Donald Duck rather than the more important news of President Hugo Chavez' return to power in the wake of an unsuccessful opposition coup d'etat funded and actively encouraged by the Bush 2 dictatorship in Washington DC. One sensed, then, a feeling of journalistic outrage in Andres' decision to react against the "repressive and restrictive" edict of routed Marcel Granier at RCTV and to tender his resignation with immediate effect. It wasn't as if Andres was going to end up in the unemployment queue for very long, anyway, and his early appointment to a press attache role at Venezuela's Washington DC embassy gave him excellent opportunity to broaden his linguistic skills as well as to get a taste for a little media empire building of his own. It had always been known that he had had greater ambitions in an earlier incarnation at CNN-Espanol to become a Spanish-language Rupert Murdoch to equal if not surpass Cisneros himself. Back home in Caracas after his DC-sojourn, Andres Izarra began the process at the Ministry of Communications & Information (MinCI) enlisting the support of Yuri ("I've been a revolutionary for 25 years") Pimentel who is described, aptly, in last week's issue of the political weekly Verdades de Miguel as being Izarra's "bag-man" ... we don't know if it was an editorial elusion to the very embarrassing (for Chavez) millionaire suitcase drama currently playing in a Miami courtroom ... but when the Tom & Jerry act went on to head the CNN-Espanol emulation, TeleSur, we thought Andres had realized his life's media empire ambitions ... BUT NO! In an unholy sequel, Izarra returned to MinCi while close buddy Pimentel, amazingly, was given the keys to the sweetie shop at state-owned Venezolana de Television (VTV) in what seemed like a move to build a mini-empire all of his own ... at least until luckless Pimentel committed a further faux-pas to demand payment from Globovision for running selected clips from VTV's wall-to-wall coverage of Chavez events to which the Channel 33 station had purposefully been excluded by Izarra edict. It wasn't the first time that Andres Izarra had had to pick up the pieces for the incompetencies of his personal bag-man, but ... the saga goes on! YES! There is more than enough for Otero and Ravell to vent their spleens over in a sadly mis-managed Chavez government media sector and the MinCI ministry's ad hoc political management that never seems to understand the subtle differences between a government information service and all-points rallying for the President's new-found United Socialist Party of Venezuela (PSUV). It's a long, long, long way from President Hugo Chavez' original thesis of democratic governance from the grassroots to the top. While Chavez himself may well be sticking to his guns to promote the original thesis, a lot of the rest of his motley crew of insider manipulators do NOT have such ambition and it's beginning to show at the seams. Crime is up! Corruption is up! The negative statistics are up, up, up ... and all the while, Chavez is seen to be fluttering hither and thither on his presidential jet delivering multi-$ millions to other countries while seemingly unable -- or unwilling -- to do the same for Venezuelan citizens who have been waiting years in Chavez' own mandate period, for fulfillment of payment promises made and still not delivered. YES! President Chavez was indeed on a flying visit to Bolivar State last week to open the International Tourism Fair (FITVEN) with all the attendant razzmatazz -- but just round the corner, Venezuelan Guayana Corporation (CVG) employees were still protesting the non-payment of labor liabilities and the critical lack of investment by central government in a whole string of state-owned CVG subsidiaries considered critically important to Venezuela's economic future. YES! Perhaps there is more glamor in buying a fleet of Chinese warplanes, Russian submarines and assorted heavy weaponry from both to protect and secure the national sovereignty of Venezuela from all invaders. It is certainly more politically glamorous to buy in more than a million laptops from Portugal and to send $-millions in air to Bolivia, Ecuador, Nicaragua and other points of the world compass. But the incredibly impoverished unemployed of Venezuela's under-developed Guayana region are asking when, if ever, President Chavez and his minions are going to give their attention to their horrific plight. Cynics may say that it might all be part of a possible Chavista populist political ploy to loosen the purse strings at the elebenth hour just before November 23 local and regional elections ... but with only weeks to go, and CVG president & CEO Rodolfo Sanz' belated claim that there just ain't no money left in the kitty, it'll take quite some effort by the Izarra/Pimentel Tom & Jerry team, this time, to spinmeister their way out of this mess. Izarra threatened to resign when Pimentel went loco last time ... perhaps now it's time for the both of them to do the honorable thing and step down.